In Winthrop, MA, consult Julianne C. Doyle DMD at Brooks Dental for the best orthodontic care. Smile aesthetics and good tooth alignment combine to keep patients healthier, their smiles attractive and their confidence high. What could be a better blessing than a healthy smile? The answer is a healthy, straight smile. Really, the 2 features combine for best oral and emotional well-being. Dr. Julianne C. Doyle, Winthrop, MA orthodontist, helps patients achieve both at Brooks Dental PC. Your oral health is a serious business, and the dentists at Brooks Dental take it seriously. From preventive and restorative dentistry to cosmetic services as well, taking care of teeth and gums delivers good oral health and helps preserve systemic health, too. Orthodontics plays a huge role in oral health–so critical that the American Association of Orthodontists recommends children have an evaluation for braces by age 7. Necessary treatment can be planned in stages to accommodate growing teeth and jaws and accomplish necessary correction. 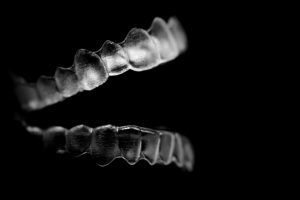 Metal braces or Invisalign: which is better? The answer is not one system being better than the other. It’s really deciding if traditional braces more appropriate or are clear Invisalign aligners? Dr. Doyle offers both and has the advanced training and skill to evaluate patients to decide which will best help their particular problems. Traditional metal bracket and wire braces treat a wide range of bite, alignment, spacing and crowding issues. Bonded directly to tooth surfaces and directed by wires that exert vector forces to reposition teeth, traditional braces work well for complex cases. However, they pose problems of dietary restrictions, complex daily hygiene and not so great aesthetics. Many teens and adults shy away from these appliances because wearing braces can be embarrassing. Invisalign clear aligners were developed to alleviate self-consciousness stemming from metal braces. Invisalign appliances are custom-made from thin BPA-free acrylic to snap tightly over teeth, moving them gradually into more favorable alignment. Hygiene and eating are easier with Invisalign as the aligners are worn for 20 to 22 hours a day, and patients can remove them as needed to brush, floss and eat. The aligner pairs are changed every 2 weeks or so as treatment progresses and Dr. Doyle assesses patient progress. Good for all but the most complex of orthodontic issues, Invisalign treatment typically takes 9 to 18 months, a shorter term than metal braces. An attractive smile is a great asset. Could you improve yours with orthodontic treatment? Find out by arranging a personal consult at Brooks Dental PC. Contact the Winthrop area office today.